Lashes. Eyebrows. Two of the facial features looked at most ... or, at least, two of the ones we spend the most time prepping and preparing each day. And whether this beauty chick is putting on mascara or preparing my eyebrows for the day ahead, there is one item I simply cannot live without. Intrigued? Why, it's the Sephora Collection Pro Brow Comb #21, of course! This tool has come in handy on more occasions than I can count. It separates lashes perfectly, even when applying the wettest and clumpiest of mascaras. It brushes even the most unruly of eyebrows, even after I've tossed and turned all night and they're sticking out in a million different directions. I've honestly been more thankful to this little brush and comb than I would ever have thought possible! While I used to be enamored only of the comb side -- its metal teeth are tapered ever so slightly to really pull through the lashes -- I have now discovered the amazing wonders of the brush side as well. It's created with boar bristles, and doesn't tug or pull at the skin as you run it through your brows -- instead, it massages them and works them into place at the drop of a hat! The Sephora Collection Pro Brow Comb #21 retails for $15 at sephora.com. 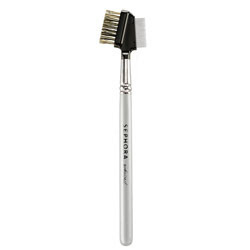 I have this brush and it is definitely worth the $10 price tag.